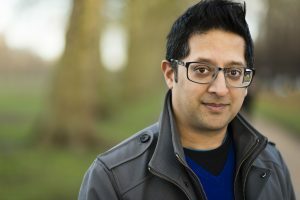 Sumit Paul-Choudhury – Writer, editor, thinker and maker. Easily distracted neophile. I’m Sumit Paul-Choudhury. I’m a writer, speaker and thinker about science, technology and the future. Between 2011 and 2017 I edited New Scientist, the world’s most popular science weekly. Trained as a physicist at Imperial College, I subsequently turned my hand to journalism, working in London and New York, and spent fifteen years writing about finance and technology before returning to science in 2008. In addition to the day job, I was editor-in-chief of Arc, an acclaimed digital publication dedicated to the future, between 2012 and 2014; and in 2016 I served as the founding creative director for New Scientist Live, the world’s most exciting festival of ideas and discovery. I aim to make complex subjects comprehensible and relevant, from artificial intelligence to black holes, leaving readers fascinated and uplifted. I also like to talk about the future, and about how innovation and discovery change the world. I’ve written for publications ranging from the Wall Street Journal to the New Musical Express, and spoken to audiences ranging from Oxbridge dons to schoolchildren and from fashionistas to investment bankers. I’ve also served as a judge for the Samuel Johnson Prize for Non-Fiction, the Wellcome Book Prize and the Royal Television Society Programme Awards. I’m a Fellow of the RSA, the founder of Chantepleure Productions and a founding member of the Bishopsgate Experimental Noise Theatre, among other side projects. I live, work and fail to sleep in London.